Let's face it - the thought of yet another movie on baseball, a concept as alien to the Indians as igloos to the Arabs, does not exactly bring to mind a packed theatre. In fact, one imagines that multiplex managers, having decided to dedicate a screen or two to Moneyball, are burdened with great anxiety about the fate of the box office, despite the Oscar buzz surrounding the film. To put their fears to rest, as well as yours, here's a look at what the Brad Pitt starrer is all about. Based on a book by Michael Lewis, Moneyball is the true story of a baseball team's general manager, Billy Beane, and his efforts to make his team, the Oakland Athletics, a competitive one, at the turn of this century. Beane (Brad Pitt) was a Major League player a while ago - a career that demanded him to sacrifice the scholarship to Stanford. Beane is not particularly proud of his record, but he was a formidable player in his time. Now, he manages a shoddy team, who lose all major games, and the only star players are shifting to other leagues with better pay. The problem, according to Beane, is the pathetic pay for the players. While on a friendly visit to the Cleveland Indians office, Beane comes across Peter Brand (Jonah Hill), who is a fresh economics graduate from Yale. Beane is impressed with the young man's bookish knowledge on strategy in team selection, and hires him as his assistant. Armed with a new approach to the game, Beane decides to make a few changes to the way the Oakland Athletics is formed. The biggest disadvantage the script has, in relation to this country, is the baseball jargon. Besides that, it is a flawless script. There is a lack of excessive, maudlin emotion of the team spirit kind, to begin with. Melodrama is not forced; it is a part of the daily lives of these players. And the humour is subtle. But despite the film completely missing out on the technicalities of the game, and the importance that plays on the premise of the plot - game strategy - you can still enjoy the story of a man who changed the face of baseball teams in the USA. This one man, with a vision that his peers scoffed at, laughed in the face of adversity and stuck to his guns. Steven Zaillian and Aaron Sorkin have done their best work yet, as writers. More than 80% of the setting is limited to locker rooms, league offices and baseball stadiums. More for visual relief than necessity, there are some shots of long car drives and countryside, and the interiors of a few houses. The production design, therefore, though not startling, is restrained, and accurate. Costumes comprise mostly team jerseys and office wear, and no puritan will find fault with the precision of the colours and styles incorporated to give the movie a feel of the world of baseball in the early 2000s. The star of the movie is definitely Brad Pitt. A hardened yet superstitious (Beane never attends the games) manager, with conviction in his far-reaching methods, his character goes through the most tiresome period of his professional years, but never wavers. This has to be the most challenging role that Pitt has undertaken after The Curious Case Of Benjamin Button, and he has outdone himself. He even looks like a somewhat younger version of Robert Redford, and that adds to his overwhelming screen presence. Jonah Hill may be playing the slightly lost assistant, but he is the only one who could have carried it off. This is a far cry from the slapstick roles that he is known for. It is Philip Seymour Hoffman, who plays Art Howe (manager and coach), who is wasted, relatively. Any more screen time, and he could have stolen the thunder from both Pitt and Hill. Moneyball is a must-watch this weekend, despite the alien sport that it revolves around. A word of advice for cine-goers - look up the basics of the game and understand the importance of OBPs and player line-up before you buy a ticket to the movie. 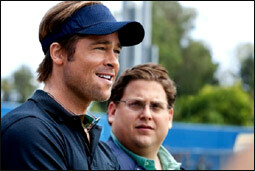 Be the first to comment on Moneyball! Just use the simple form below. fullhyd.com has 700,000+ monthly visits. Tell Hyderabad what you feel about Moneyball!